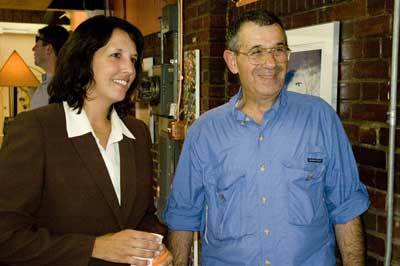 Kim Driscoll cuts ribbon on August 17, 2006, to celebrate exciting new season of art and crafts at Artists' Row. 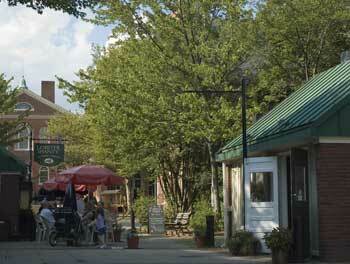 Artists' Row, between Derby and Front Street, is in the heart of historic downtown Salem. Onlookers include artists, artisans, and young students. Artist's Row is in the shadow of the old Town Hall, and in walking distance of Salem Harbor, many historic buildings, and the Peabody Essex Museum. 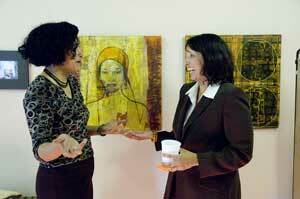 Barbieo Barros Gizzi shows her artwork to Mayor Kim Driscoll at the Row Gallery. 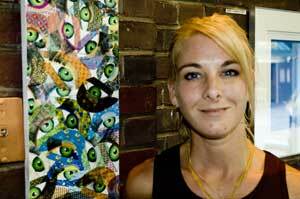 The Gallery is in a brick building leased by Salem for the summer to Gizzi, an experienced gallery manager and an accomplished artist. The Row Gallery may be the only venue for contemporary art in Salem and Peabody, and complements the exciting renewal and development of old Salem. The Mayor previewed forthcoming exhibit at Row Gallery organized by Gizzi. 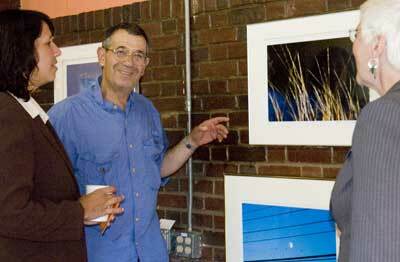 At the Row Gallery, Jerry Halberstadt reviews his photographs of nature in Salem with Mayor Kim Driscoll (left) and Joanne F McCrea, Assistant Director of the Salem Chamber of Commerce. 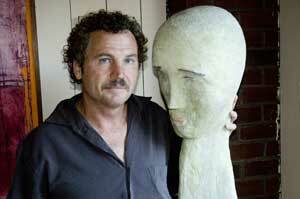 Artists at the Row Gallery: Terry Bastian, sculptor, with his life-size statue, Sandra Kelley with one of her works.